Awarded to graduates who have demonstrated remarkable achievement in the previous year. A strong belief in the importance of education and devotion to Baylor was set in motion for Bill and Pat Carlton more than a century ago, due to the investment of Bill's grandfather, Claude S. Carlton, who allocated family resources to ensure all seven of his younger siblings attended Baylor or Mary Hardin-Baylor before he earned his Baylor degree. 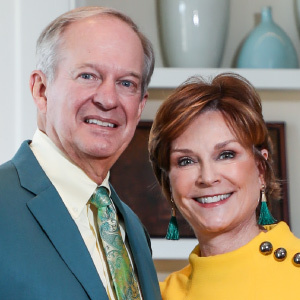 The couple established the Claude S. Carlton Endowed Scholarship Fund through the Carlton Family Foundation in his honor and have supported the Paul L. Foster Success Center's Office of Access and Learning Accommodation and the Hankamer School of Business.